Caption: Matteo Rigamonti with a banner announcing Weerg. Weerg has invested heavily in HP’s 3D inkjet based Multi Jet Fusion printers, initially in three of the 4200 print systems. Three of the uprated 4210 models were soon added and the original 4200s were upgraded, in an order worth €3 million. This is the largest installation of the Jet Fusion 4210 printers in Southern Europe. Even so, they only represent 25% of Weerg’s turnover: the majority comes from the CNC side, with a battery of 10 Hermle C42Us with five continuous axes for machining, fitted with high end Wenzel LH co-ordinate measurement systems. Weerg’s business has grown so much that in March it will move to a new factory in Gardigiano, near Venice. Another 11 operators have been hired to take Weerg into 24/7 operations. Rigamonti’s pixartprinting was one of the first companies to successfully sell print online internationally, with the offer to deliver almost anywhere in Europe within 48 hours. Weerg likewise offers online ordering with fast delivery across Europe. Caption: Weerg samples: 3D printing can handle shapes that would be difficult tp produce by other methods, certainly not so quickly. Rigamonti often exhibited at FESPA events, seeking trade customers for pixartprinting. In 2014 he and his partner company Alcedo sold 97% of pixartprinting to Cimpress, the Dutch owner of the online print provider Vistaprint, for €127 million. The remaining 3% was sold two years later. Rather than enjoying a well-funded early retirement, Rigamonti soon missed having the challenge of business building, which led to Weerg and 3D. Instead, there is a crossover in the workflow and sales techniques he already developed at pixartprinting, he feels. “When you know marketing you can use the same means, because communication now is just no longer just press. We use AdWords, Facebook, e-mail and our usual marketing. Facebook is a very powerful way to communicate, even stronger than AdWords. The production workflow of customer files for 3D is also similar to 2D, he says. Weerg uses software for process automation that includes a constantly updated ERP system that allows daily management of the processing of thousands of pieces, with nesting software to optimise the loads during processing. CNC machining and 3D printing are used for broadly similar applications, certainly in engineering. CNC is a subtractive process, in that it starts with a block of material and carves away at it to create the final shape. 3D printing is additive, in that it builds up layers of material from nothing. There are pros and cons for both: in particular CNC is well established and can work very well with metals, as well as other materials. 3D printing on the other hand is less precise or repeatable and can’t be relied on for precision threads and fits. However it can create shapes with voids, ie hollows with internal structures and reinforcements that are impossible by any other manufacturing method, whether machining, casting or injection moulding. Caption: The Hemle CNC machines still bring in 75% of revenues. Originally Weerg concentrated on CNC services, mainly because Rigamonti wasn’t happy with the productivity of 3D printing system available at that time. “I started with the CNC machine because I thought that it was more profitable,” he says. “The 3D printing machines were not ready to be industrial. When I founded Weerg at the beginning I wanted it to be a 3D printing company. But the technology was really behind my expectations. Supports are temporary structures that are printed to hold the main object together while it is gradually built up in layers. These are needed by low end filament extrusion (FDM) 3D printers and also by 3D Stereolithography (STL), that uses lasers to harden liquid photopolymer. Selective Laser Sintering (SLS), uses a high powered laser to fuse layers or resin powder and does not need supports because the powder is self-supporting, but it’s slower than HP’s Multi Jet Fusion system, which also uses powder. Pixartprinting grew into a major user of HP’s 2D Indigo digital production presses, where Rigamonti built up a relationship with HP that was also to carry over to Weerg. 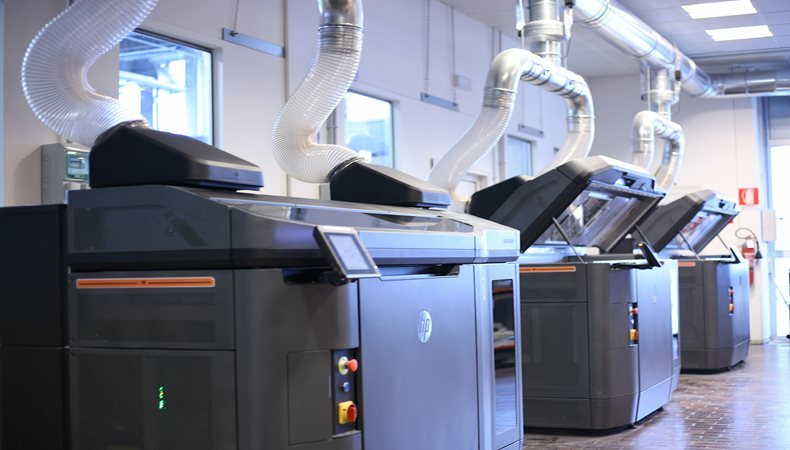 Caption: Three of the HP Jet Fusion 4210 print units at Weerg. Pic by Marco Lanza, Tecniche Nuove. After each layer of liquid is complete, it is cured by heat lamps. “Since the powder bed is already heated and melting is not based on laser movement, each printing layer takes the same time, leading to foreseeable build times,” says Garcia. Once one layer is finished, powder is distributed on top of the previous layer and the process is repeated until the part is complete. The loose powder supports the part until it is complete, then needs to be removed. There are separate hardware units for printing and post-processing. After printing and fusing in the first unit, the container of parts and unused powder is removed to a separate post-processor, which recovers the powder for re-use. Meanwhile the printer unit can start on the next set of items. “Additionally, the part can be bead-blasted and dyed black to achieve an aesthetically pleasing surface,” says Garcia. The second model, HP Jet Fusion 4210, is intended for 600-1,000 parts per week. HP claims that compared with the other 3D methods it “can produce engineering-grade parts at up to 65% lower cost.” Some 3D printers made by 3D Systems (3DS) use a similar inkjet and powder method, but they are slower than the HP technology. HP won’t say publicly what its machine costs are, but compares the 4200 to FDM and SLS solutions in the €90,000 to €270,000 range, and the faster 4210 to SLS printers in the €270,000 to €400,000 range. Caption: Powder removal and finishing are handled in a separate unit. There’s a choice of resin powders available for the HP printers, but Weerg only uses one, the. 3D High Reusability PA 12. This is a robust thermoplastic for producing strong, high-density parts. Other powders offer more flexibility or resilience. Caption: Parts can be smoothed and dyed black during finishing: spray painting is possible too. So, what are Weerg’s customers ordering to be made by 3D print? “I see that many customers are starting to do short runs with our machines because it's more convenient and we are faster than previous 3D services,” Rigamonti says. “Recently we did 5,000 parts of something that could have been made with injection moulding, but the customer was running late.